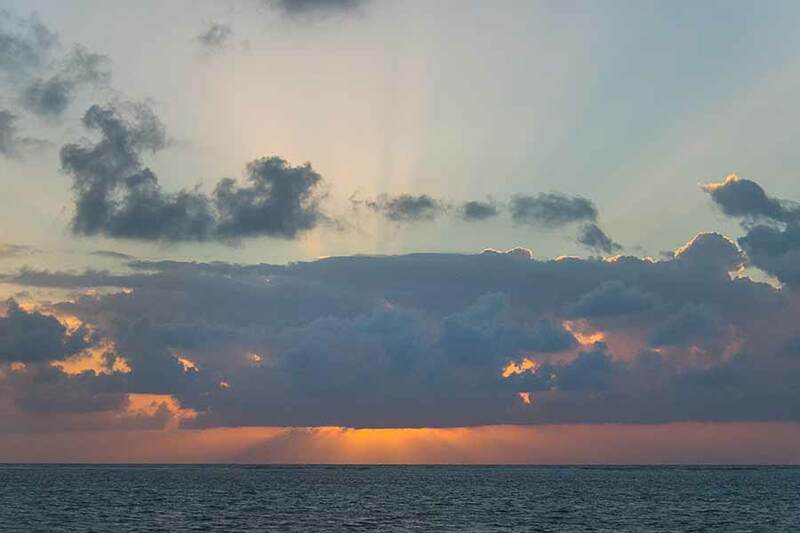 Belize NMS: A high pressure system maintains generally fair weather over our area. 24-hour forecast: Partly cloudy tonight and sunny with a few cloudy spells tomorrow. Showers will be isolated, except over southern areas where a few more can be expected. General Outlook: For Wednesday night and Thursday is for similar weather conditions to prevail. Today E-NE 5-15 kts Choppy-Moderate 3-5 ft ISOLATED SHOWERS, EXCEPT FOR OVER THE SOUTH WHERE A FEW MORE WILL CONTINUE. Tonight E 5-15 kts Choppy-Moderate 3-5 ft ISOLATED SHOWERS, EXCEPT FOR A FEW MORE OVER THE SOUTH. Tomorrow E 5-15 kts Choppy-Moderate 3-5 ft SHOWERS WILL BE GENERALLY ISOLATED. Outlook E 10-20 kts Choppy-Moderate 3-6 ft THURSDAY NIGHT:- GENERALLY FAIR WEATHER CONDITIONS, WITH ONLY ISOLATED SHOWERS DEVELOPING. On Ambergris Caye this morning we have a wind from the East-NE at 12 mph. The sky is clear and the sea state moderate. 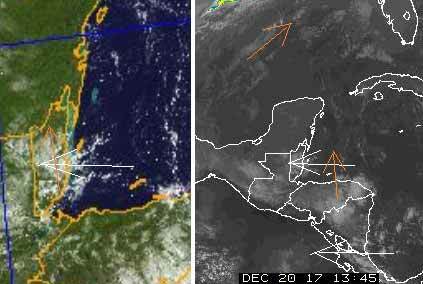 The expected high for the day is 84 f.
Presently heavy, thick cloud covering most of Belize, a few gaps up in the north and near PG. Although this all from the easterly Caribbean, it appears there is high level air activity contributing or causing this heavy cloud. Despite the heavy cloud, there are only a few, relatively small patches of rain around. There are a few lines or patches of cloud behind all this, but most is clearer sky. Looks like today will be fairly sunny, after this mornings heavy cloud clears over the next few hours, could be the odd small rain shower.